started in the first place. 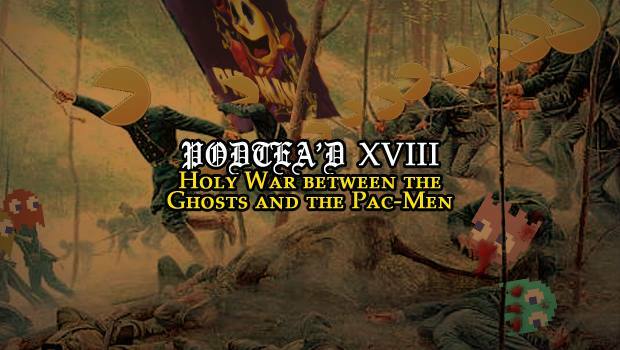 All we knew there were two sides… The Ghost-alition and the Pac-liance. For decades, millions died for the same piece of rock, again… and again… Finally, one side manage to gain the upper hand; The Ghost-alition. In desperation, The Pac-liance launches five sleeper ships. The hope was, for them to begin again, far for the wars strive that have befallen Pac-World. To start free from the prejudices that have divided us for so long. Each sleeper ships was christened after its parent nation: The Brit-Pac-kia, The Pac-land, The His-Pac-ia, The Pac-ari, The Pac-erty. Against all arms, the colony breaks through The Ghost-alition blockade, and headed for the Sirius system. Your host this week was Sam Morris with, Adam Owen, Video-of-the-Diana-crash Cirman, Matthew Shoelace, Tommy Chodakowski-Malkiewicz and Tobiichi Karlsson. Edited by Matt Turner, album art by Adam Owen. The header image was created by Tobiichi this week, isn’t it pretty?